Looking for your next paranormal romance binge read? Check out the Moonbound series. 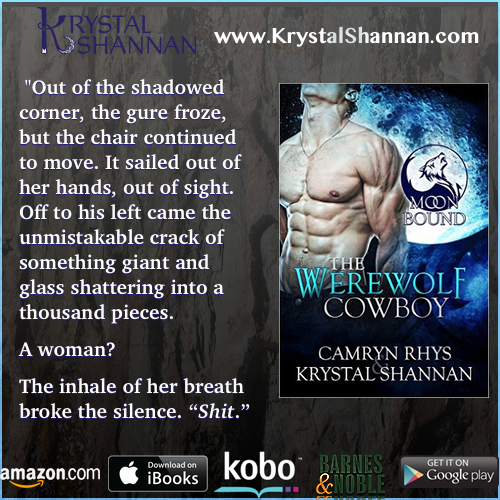 The Werewolf Cowboy is the first book and if full of fun shifter shenanigans! Get your copy for free now and enjoy until the end! Small town sheriff, Allan VonBrandt, would like nothing more than to focus only on his work and not on the leggy and irresistible brunette who won't take no for an answer. But when Fate steps in and his inner wolf won't refuse the magick pull she has on him, Allan must confront his animalistic desires–whether he wants to or not. Reyna DuBois has never met a man–or wolf–she can't tame, but Allan just might be the stubborn exception to the rule. Refusing to give up, Reyna enlists the help of her inner wolf to seduce the ever-reluctant sheriff, promising this particular cowboy the ride of his life. NOTE TO READERS: While each book in the Moonbound series contains a complete romance arc for each couple, there is a full series arc that is revealed in pieces and not fully resolved until the end of the series.